I have been swept up by the Holiday Spirit. That means something different for everyone, I know, but for me it means baking, Christmas music, and family functions. I have strict rules around the holidays, but they're mostly there so that I can really get my jolly on. Like my main rule, no Christmas music before Thanksgiving. First Halloween, then Thanksgiving, THEN Christmas. Get it straight, retailers. I love Christmas music, just at the right time of year. I especially love *my* holiday playlist, which includes Michael Bublé (shock! ), Frank Sinatra, Brian Setzer's orchestra, the Trans-Siberian Orchestra, and a few of the Carols for Cure CDs which support Broadway Cares/Equity Fights AIDS. 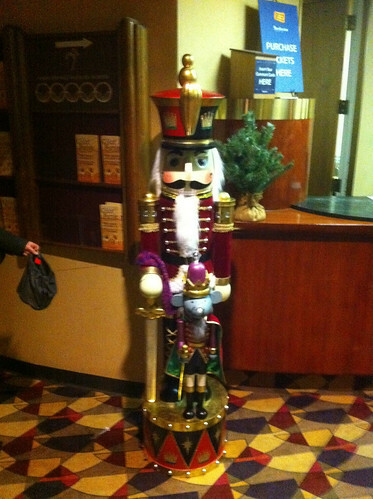 On a more traditional note, we went to see MiddleJ perform in The Nutcracker last night. I'm not normally a fan of ballet, but I am MiddleJ's biggest fan, and not in the creepy Kathy-Bates-in-Misery way. (By the way, thanks Steven King. Way to ruin a perfectly nice sentiment.) MiddleJ is incredibly talented, and I find more and more to enjoy about the performance every year. What's that? A sock with a future afterthought heel? It's the sock of choice for all Nutcrackers; you saw it here first. Here here! I totally agree with your main rule of Christmas. I know that some start the tunes in Oct, but I am waaaaay too sick of it by Christmas. And events trump shopping any day of the season. Glad you and you're knitting are enjoying yours. There is certainly something about Christmas shows with kids that really helps my holiday spirit. My daughter will be in her 5th Nutcracker this year - first time as a party child, and she is pretty pumped. I'm curious about these lambs - we have reindeer for the wee ones, and they do indeed steal the show! Jasmine, which Carols for the Cure albums do you have? I didn't know about this and since I lost my sister 2 years ago to the dreadful disease, I like to support any and as much as I can towards the research for it.